Foreign Affairs Minister Chrystia Freeland has reached out to China's ambassador to ask for clemency in the case of Canadian Robert Lloyd Schellenberg, who is facing the death penalty for allegedly smuggling 222 kilograms of methamphetamines. Foreign Affairs Minister Chrystia Freeland has reached out to China's ambassador to ask for clemency in the case of Robert Lloyd Schellenberg, the Canadian who is facing the death penalty for allegedly smuggling 222 kilograms of methamphetamines. "We have already spoken with China's ambassador to Canada and requested clemency," Freeland told reporters in Sainte-Hyacinthe, Que. today. "Canada's position when it comes to the death penalty is consistent and of very long-standing," she added. "As Canadians know, we do not have the death penalty in Canada. We believe it is inhumane and inappropriate, and wherever the death penalty is considered with regard to a Canadian we speak out against it." On Monday a Chinese court issued a death sentence against Schellenberg in what has become the latest escalation in the diplomatic rift between Canada and China. The tensions emerged in early December when Canada arrested Meng Wanzhou, the chief financial officer of the Chinese technology giant Huawei on an extradition request issued by the United States. The U.S. alleges Meng is guilty of violating international sanctions against Iran through a Huawei subsidiary called Skycom. Shortly after Meng's arrest China arrested Canadians Michael Kovrig, a diplomat on leave who is working for an NGO in China and Michael Spavor, a business consultant who arranges trips to North Korea. Asked if it was time for Canada to escalate the level of communication, to have Prime Minister Justin Trudeau reach out to Chinese President Xi Jinping, Freeland said there was plenty of talking going on between officials at present. "We are in touch with the Chinese government at a number of levels," Freeland said. 'I've spoken to the Chinese ambassador twice myself, and he has many contacts here. We are also in touch with the Chinese government in China at a number of levels, and that continuing that dialogue is very important." Global Affairs Canada confirmed to CBC News Tuesday that it provided consular assistance to one Canadian who was executed in 2015 for drug smuggling. As first reported by Toronto Star, former Canadian Ambassador to China Guy Saint-Jacques said two Canadians of Chinese origin were tried and executed while he served as envoy to the country. In an interview Tuesday with CBC News Network's Power & Politics, Saint-Jacques said Canada was only granted consular access to one Canadian because the other used a Chinese travel document to enter the country. Saint-Jacques said both former prime minister Stephen Harper and former governor general David Johnston were personally involved in asking China for clemency in the two cases to no avail. In fact, Saint-Jacques said that when Canada learned of the scheduled date of execution for the man who entered on his Canadian passport, Harper wrote a personal letter to Chinese President Xi Jinping asking for clemency. China executed the man the next day. Saint-Jacques said he doesn't think the Canadian government's request for leniency in the case of Schellenberg will change the attitude of the Chinese government. Freeland said she was proud that a "large and growing group" of Canada's allies are standing by Canada in the dispute, including Germany, France, the Netherlands, the EU, the U.S. the U.K. Australia, Estonia, Lithuania and Latvia. 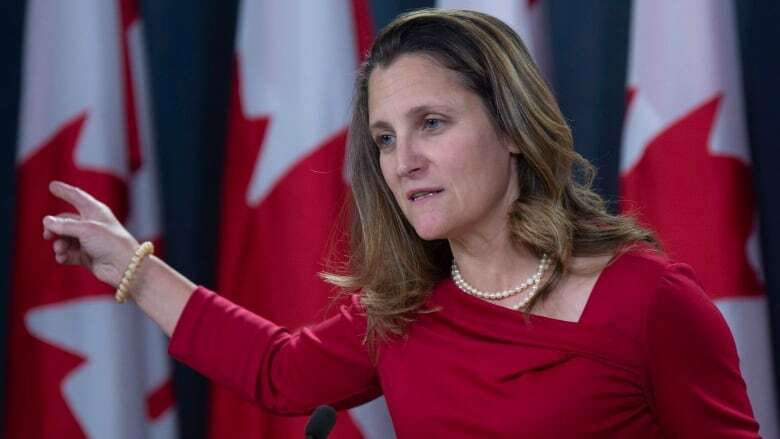 Despite the tensions, Freeland was not ready to call time on the Canada/China relationship, saying that it is a "complicated and difficult moment" in the relationship between the two countries. "It's also important to remember that Canada's relationship with China is very long-standing," Freeland said. "It is a deep relationship which has many strands to it, and I think both Canada and China are committed to that relationship going forward. But it is true that this is a difficult moment, and our government will continue to advocate for the Canadians who are arbitrarily detained."